Last night we had our first technical rehearsal for Theatre Guild of Rockingham County's production of The Best Christmas Pageant Ever. Prior to that co-directors Jeff and Melissa Mericle had a "costume parade" where the cast got to show off the costumes they had put together for approval. The idea is to evoke a Seventies-ish look (since that's the time period of the original novel). I have an entirely fresh appreciation for firefighters now, after wearing that for just one evening. It is heavy! And that's still not all of what I'll be running around in during the show. 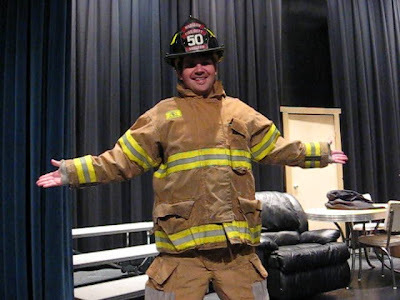 Firefighter's attire is big and bulky and gets hot inside: it's like a Snuggie from Hell. But when you think about the alternative and then realize that at the present time there is no alternative... yeah, I have to really tip my hat to the men and women who choose to do this for real. "Technical rehearsal" is just what it sounds like: rehearsing just as we've done for the past four or five weeks, but with things like props and furniture in place, going through the lights and sounds, etc. We'll do it again tonight, and then full-blown dress rehearsals next week.